I am working hard at writing reviews but I have a truly overwhelming number of books I want to review and barely know where to start. Do you want to hear about Trollope? About what matters in Jane Austen? Or perhaps about one of the many, many D.E. Stevenson books I’ve read but never got around to reviewing? So, instead of trying to beat my backlog of reviews into submission, I shall just continue reading more than I should and perpetuate the problem. Hannah Fowler by Janice Holt Giles – when I was younger, my reading diet was almost exclusively devoted to pioneer stories. I read a few of Janice Holt Giles’ books then (The Kentuckians and a few others) but never Hannah Fowler. 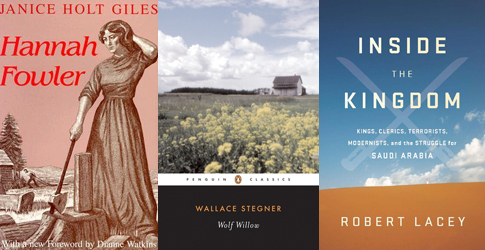 Wolf Willow by Wallace Stegner – Pulitzer Prize-winning author Wallace Stegner’s boyhood was spent on the beautiful and remote frontier of the Cypress Hills in southern Saskatchewan, where his family homesteaded from 1914 to 1920. In a recollection of his years there, Stegner applies childhood remembrances and adult reflection to the history of the region to create this wise and enduring portrait of pioneer community existing in the verge of a modern world. Inside the Kingdom by Robert Lacey – Though Saudi Arabia sits on one of the richest oil deposits in the world, it also produced fifteen of the nineteen 9/11 hijackers. In this immensely important book, journalist Robert Lacey draws on years of access to every circle of Saudi society giving readers the fullest portrait yet of a land straddling the worlds of medievalism and modernity. Moving from the bloody seizure of Mecca’s Grand Mosque in 1979, through the Persian Gulf War, to the delicate U.S.-Saudi relations in a post 9/11 world, Inside the Kingdom brings recent history to vivid life and offers a powerful story of a country learning how not to be at war with itself. 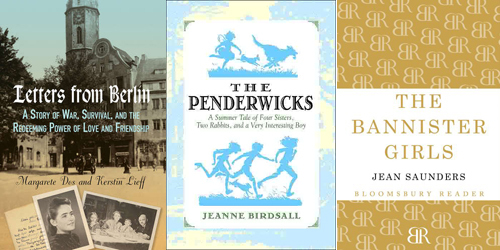 The Penderwicks by Jeanne Birdsall – This summer the Penderwick sisters have a wonderful surprise: a holiday on the grounds of a beautiful estate called Arundel. Soon they are busy discovering the summertime magic of Arundel’s sprawling gardens, treasure-filled attic, tame rabbits, and the cook who makes the best gingerbread in Massachusetts. But the best discovery of all is Jeffrey Tifton, son of Arundel’s owner, who quickly proves to be the perfect companion for their adventures. The Bannister Girls by Jean Saunders – The bright dawn of the twentieth century finds itself shadowed by the strictures of the Victorian Age. Women, whatever their status in society, are still women and are expected to conform to their well-defined role in life as a mother and wife. For the Bannister girls, daughters of a wealthy and respected family, this is not enough. I’m not familiar with these but hope you enjoy. I understand about reviews. Unless I do it soon after reading the book, it won’t get done. I finished a book over the weekend, haven’t written the review, and thinking it won’t happen now. Would it be mean to say we want to hear about all of them? Probably. 🙂 We’d rather you just enjoyed them. I have a soft spot for the Penderwicks. I gave this book to my nephew when he was much younger and it became one of his favorites — being the book aunt is very rewarding sometimes! I would be particularly interested in the Stegner book, Claire. I always bring more books home from the library than I can ever, ever read, let alone review. Enjoy what you can. I came home with 4 books of poetry by Li-Young Lee. Seem to be in a mood for poetry and just recently discovered. him. I must admit to slinking in with my overdo copy of Mrs. Queen Takes the Train, which I thoroughly enjoyed. I’d be torn between Letters From Berlin and The Bannister Girls – I’ll be looking for both. Inside the Kingdom looks quite promising. Can’t wait to read your review! I’d love to hear about Austen and Trollope – Stevenson, too. Come to think of it, I enjoy your blog so much that I look forward to reading whatever you write! Looks like you will be visiting a variety of places! Enjoy! I’m always willing to read about Austen, Trollope (by which which I mean Anthony, not Joanna)and DE Stevenson! The Penderwicks sound interesting, and Wolf Willow. I’m interested in your thoughts on Inside the Kingdom. I returned from a trip to Saudi Arabia a few months ago, and have been thinking I really need to find a credible nonfiction account about the country, since I know so little about it.